This guide explains why error code 0xc000007b happens and introduces step-by-step solutions to fix it. If you are troubled by the error, read on and find out solutions here. There are a great many Windows errors we may meet while using computer such as 0x80070057, 0x80004005, 0x80070005 and 0x80070002. Many of them are fixable but it is still annoying to encounter errors, as it takes too much time and energy to search solutions. 0xc000007b application error is very common and users may encounter it on a regular basis. However, few users know how to fix it. That's because this error can be caused by various reasons and there is no single fix which is able to deal with it. Here we'll talk about different methods for different causes. "I upgraded my computer to Windows 10 last month with no major problem. But recently it became slow and showed other problems. Thus I tried reinstalling the same version of Windows 10, hoping to get away from the problem. Finishing installing OS, I had to install commonly used applications, and I received error "The application was unable to start correctly (0xc000007b). Click OK to close the application." "I searched this error online and viewed a lot of webpages related to the error. The suggested solutions were for Windows Vista/7/8/8.1, but I need fix it on Windows 10. What's more, my email application did not work, and I fixed it by downloading Visual C++ Redistributable for Visual Studio 2012 Update 4. I'm using a desktop running Windows 10, i3-2100 CPU, 8GB RAM, 2TB Seagate HDD. Is there any easy solution to fix the error for Windows 10? Please help!" What does the problem mean? Windows is user-friendly and easy to access and has become the most widely used operating system and it is used by users all over the world as computer system. At present, many users have upgraded their computer to Windows 10 which is more than just a PC operating system; it also runs on Windows phones – and on small tablets as well. One of the common issues on all operating systems is that it is not perfect and errors occur due to some reason. For example, many users have to face 0xc000007b error while accessing software like Games Fifa, Far Cry, Call of Duty, IOS burner software and many other games and application which are highly used by the people; the error message is "The application was unable to start correctly (0xc000007b). Click OK to close the application." This unable to start error is an issue happened to applications on Windows computer and it can be a stressful problem. But this error does not necessary mean it is beyond repair or the end of involved software. There must be certain reason leading to the error when you attempt to run the software. You will become able to fix the problem after try several troubleshooting steps here. There are many reasons behind the Windows error code 0xc000007b and this part lists the most common ones. The error code means an invalid image format. Specifically, you are attempting to start an application which is designed to run on 64-bit operating system. But your computer is running 32-bit Windows. The 32 bit application cannot load a 64 bit dll, thus the mixing up 32 bit with 64 bit environment brings about problem. 0xc000007b error is also has something to do with programs installed on your computer such as .NET Framework, Direct X and Microsoft Visual C++. It tends to appear when you try to launch high graphic games like Far Cry Assassins without updating to .net Framework. When .NET framework is absent from your computer, you'll not be able to run apps build on it. It is also possible to get this error when you are installing Windows 10, 8, 8.1, or 7. There are chances of getting this 0xc000007b error while you are not running the software as administrator. Windows fails to process certain file or required settings to run the application and then the software can't start correctly. This error also can be caused by problematic software with corrupted files, virus infections, registry errors, etc. There are no defined solutions to deal with this application error. Below we have a variety of methods you can follow to get rid of the 0xc000007b error message. In many cases you may need more than one of fixes, thus you need try them one after another if the first doesn't work for you. If the error code is caused by application error, you can fix it by reinstalling the application which you are trying to run. First, you need to uninstall it and remove anything related to the software from computer. Then restart computer before starting reinstallation. During installation, please turn off antivirus software. Note: Scan your computer before turning off antivirus software. Some software requires running as administrator, and error will occur if do not launch it as administrator. Sometimes, providing administrative privilege can solve this problem. To do this, please right click the shortcut icon on desktop and select "Run as administrator" option. Click "Yes" when you see the popped up message box and you will be able to run the application successful. If you can't find the option after right clicking application icon, select "Properties" option from the right-click menu. Click "Compatibility" tab on the Properties window and check the option "Run this program as an administrator". Then click OK button. .NET Framework may give rise to all kinds of errors and problems if it is not properly installed or updated. If your computer doesn't install the latest version of .NET Framework, update it to wipe out error. Step 1 Click "Start" button to select Control Panel and click Programs and Features. Step 2 Click "Turn Windows features on or off" item on the left panel. The "Windows Features" window pops up. Step 3 On the "Windows Features" window find and click .NET Framework 3.5 and press OK. Then it will start downloading and installation. Step 4 Restart computer and check whether this error is fixed. If this method cannot solve 0xc000007b application error, continue reading! Step 1 Download 32-bit xinput1_3.dll and extract files with a compression tool. It is advised to back up the original xinput1_3.dll before trying this solution in case that you failed to complete it as panned and you can restore it. The xinput1_3.dll file usually locates at: C:\Windows\SysWOW64. Step 2 Copy the file extracted from downloaded file to the location: C:\Windows\SysWOW64 and paste it there. Step 3 Select "Copy and Replace" if you get any prompt. To avoid errors you should always make sure your computer has updated to the latest version of DirectX. If none of the previous solution works, you should try updating DirectX. The way to check whether your DirectX is the latest version is downloading DirectX Runtime Web Installer from Microsoft's official website. Download the setup file and run it. Then you can follow on-screen steps to reinstall it. When installation completes, you need to restart computer. Microsoft Visual C++ runtime packages are of great importance to Windows application. If they are not well installed, programs can't work normally and report various errors including the application error 0xc000007b. Microsoft Visual C++ runtime packages are released in both 32-bit and 64-bit versions. Step 1 Click "Start" button and select "Control Panel". Then you can find "Uninstall a program" on control panel, click it. Step 2 Find all Microsoft Visual runtime packages and uninstall them from your PC. After that, reboot compute. Step 3 Go to Microsoft official site to download visual runtime packages and install each of them. The installation process needs restarting PC several times. Step 1 Right click the application that can't start correctly and select "Properties". Step 2 Click "Compatibility" tab on the Properties window and click button "Run compatibility troubleshooter". Step 3 Select "Try recommended settings", and you can either test the application or just click next. Step 4 If the previous step doesn't work, you can select compatibility mode manually from the drop-down menu. Select earlier version of Windows and click "Apply" and "OK" buttons. Hard drive issue is likely to give rise to various problems and checking hard drive can remove these problems. You can follow steps given below to check your hard disk for errors. Step 1 Run Command Prompt as administrator on your PC. If you are using Windows 7, click Start button and search "cmd" in the search box. If your computer is running Windows 8/8.1, press the windows key and search for "cmd". Right click cmd and select "Run as administrator". Step 2 Type chkdsk c: /f /r in Command Prompt and press Enter key. Step 3 If your Windows is installed in drive C, then you'll get message "Chkdsk cannot run because the volume is in use by another process. Would you like to schedule this volume to be checked the next time the system restarts? (Y/N)" Type Y and press Enter key. Step 4 Computer will restart and check the disk during restarting. A clean boot can help you find out whether this error is caused by a third party application, for it is able to eliminate software conflicts. Please note that you must log on computer as administrator to perform a clean boot. Once you've done with the troubleshooting, you need to reset computer to start as usual. The following steps take Windows 10 as example. Step 1 Click Start button and search for msconfig. Click System Configuration from search result. Step 2 Select "Service" tab on the dialog box. Select "Hide all Microsoft services" and click "Disable all" button. Step 3 Click "Startup" tab to tap "Open Task Manager". For startup item here, select each and click Disable. Step 4 Close Task Manager and click OK on the "System Configuration" window. Restart computer. We can create a new user account to check whether this issue occurs in the new account. Step 1 Click Start button and select "Control Panel". Step 2 Select User Accounts and "Manage another account" respectively. Step 3 Click "Add a new user in PC Settings" and then follow the on-screen instructions to complete the process. Step 4 Once this is done, login to the new user account and check if the issue occurs in the new user account. 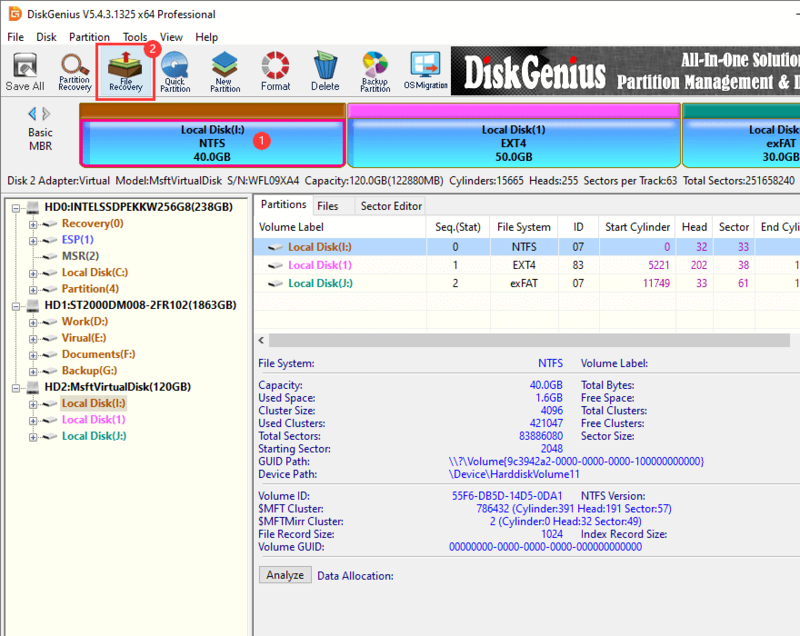 Step 1 Launch Eassos DiskGenius and select the partition where you lost data and click "File Recovery" button. Step 2 Select "Complete Recovery" mode and click Start button. 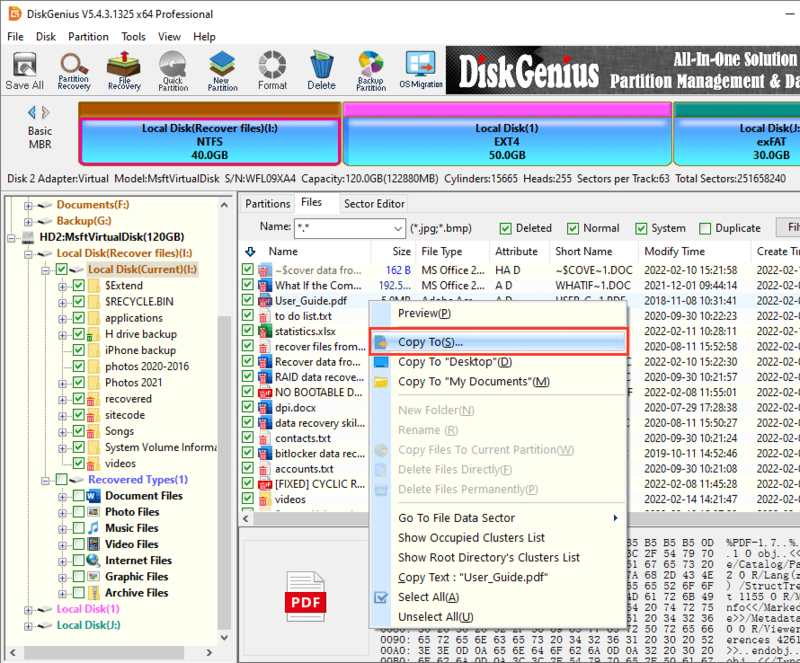 Then DiskGenius will run full scan on the selected partition.